Samsung Galaxy A8 (2018) and Galaxy A8+ (2018) were officially launched this week. Samsung has revealed its price and availability for both two smartphones in Vietnam. The latest mid-range smartphones from Samsung feature an Infinity Display with an IP68 dust and water resistance rating. Enjoy an expansive view of the Samsung Galaxy A8 (2018) And Galaxy A8+(2018) with the Infinity Display. It’s a beautiful, large display that extends from side to side for an expanded screen that you will love to see. This is the first phones from Samsung company to have a dual-front facing selfie cameras. As we mentioned, Samsung has officially announced the pricing and availability for the Galaxy A8 (2018) and Galaxy A8+ (2018) in Vietnam. The Samsung Galaxy A8 (2018) is priced at VND 10,990,000 (roughly Rs. 30,980) and the Samsung Galaxy A8+ (2018) is priced at VND 13,490,000 (roughly Rs. 38,040), according to Samsung Vietnam. Samsung also mentions that the two phones will be made available on January 6, 2018. Pricing and release date are applicable only to the respective market and will vary for others, but, give us a good indication of what to expect. Whether your taste is bold or classic, you can take your pick of stylish colors on the Galaxy A8 and A8+. And with the smooth curves creating a comfortable, ergonomic grip, it’s a beautiful phone you won’t want to put down. Samsung’s Galaxy A8 (2018) and Galaxy A8+ (2018) will both be available in Black, Gold, Blue, and Orchid Grey color variants. These offbeat options suggest that Samsung is targeting a younger demographic with its mid-range offerings. The Galaxy A8 (2018) features a 5.6-inch full-HD+ (2220×1080 pixels) Super AMOLED with an 18.5:9 aspect ratio, while the Galaxy A8+ (2018) sports a 6-inch full-HD+ (2220×1080 pixels) Super AMOLED display with the same aspect ratio. You’ll feel fully immersed in what’s on screen thanks to the Infinity Display’s 18.5:9 ratio. The biggest display Galaxy A phones to date, it offers a wide horizontal view, providing a stunning cinematic experience. Samsung Galaxy A8 (2018) And Galaxy A8+(2018) both the smartphones are Powering the internals with a 2.2GHz octa-core processor (two cores clocked at 2.2GHz and six cores clocked at 1.6GHz) on both the phones. And coupled with 4GB of RAM, while Galaxy A8+ comes with another 6GB RAM variants. Taking stunning photos the Galaxy A8 and A8+ is as easy as tapping the shutter. The Dual Front Camera innovates selfies and, putting the focus on you and your friends so you can capture moments in a new way. And with the rear 16MP camera, the surrounding scene will come out bright and clear, too. Whether out at night or caught in the dark, you’ll capture the scene clearly with the improved low-light capability on the Galaxy A8 and A8+’s rear camera. Its bright F1.7 lens, larger 1.112m pixels, and bigger 1/2.8” sensor bring in light from the environment to make photos crisp and detailed. Whether multitasking or gaming, it’s fast and seamless. And you can easily keep important things on hand with 32/64GB of inbuilt storage that can be expandable via microSD storage up to an additional 256GB. Samsung Galaxy A8 packs a 3000mAh battery while Samsung Galaxy A8+ packs a 3500mAh battery. Samsung Galaxy A8 (2018) And Galaxy A8+(2018) both the smartphones come with Fast Charging support with the charging wired. 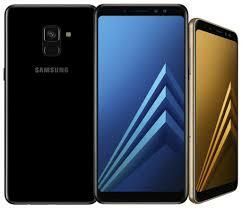 Samsung Galaxy A8 (2018) And Galaxy A8+(2018) both the smartphones Connectivity option including Wi-Fi 802.11 a/b/g/n/ac (2.4/5GHz), VHT80, 256QAM, Bluetooth® v 5.0 (LE up to 2Mbps), ANT+, USB Type-C, NFC, Location (GPS, Glonass, BeiDou). Sensors in Samsung Galaxy A8 (2018) And Galaxy A8+(2018) including Accelerometer, Barometer, Fingerprint Sensor, Gyro Sensor, Geomagnetic Sensor, Hall Sensor, Proximity Sensor, RGB Light Sensor.